The first house built in Copper Cliff, the Johnson Boarding House, which burnt down long ago is now the site of the Copper Cliff Museum. The Copper Cliff Museum house was moved there in 1972 from its original location at 16 Clara Belle Road (Figure 1). The Museum house was built by Charles Augustus Sanders. Charles Augustus Sanders was born in Shanty Bay, Oro Township, near Barrie on April 30th, 1872 to Thomas R. Sanders and his wife Louisa Ann Batt. He lived and went to school there. He worked at a large sawmill which was owned by his uncles, the Chew Brothers, Joseph and Samuel, in the Midland area. During the 1890’s, The Chew Brothers sawmill obtained a contract with the federal government to cut the white pine from the watershed of the Whitson Lake and river. They moved their mill, employees and families from Minden to Sudbury and north-west to Chelmsford, on a newly constructed railway. At Chelmsford, the mill was offloaded and set up on a site just a few hundred yards north of the newly constructed Chelmsford railway station. This site was later taken over by the Thompson sawmill and even later a foundry was built, eventually to be known as Sauve Street. The families were two brothers and a sister married to two sisters and a brother, their sons and daughter, nephews and nieces. The crews included fifty or more saw men, boiler men, tree cutters, skidders and teamsters. From the Sudbury Journal November 9th, 1891: Mr. Joseph Chew of Chelmsford, lumberman gave a party attended by big shots from Sudbury and Reeve E. Belanger of Chelmsford. Miss Batt and Miss. Jacobs sang. Mr. Walder was given credit for the affair (Chew Brothers employs 150 men and 50 horse teams). Also arriving on the train, were two nephews and a niece, Charles Augustus Sanders, age 18, his older brother Jack, age 21, and sister Eliza, age 15. They were children of the owner’s wife’s older sister Louisa - Ann Batt. In 1895 another brother Thomas, age 15 arrived and the three brothers teamed together purchasing three farms, after they had cut the white pine off the properties for the Federal Government. These farms are located on Lots 5 and 6 Concession 1 and 2 Balfour Township. A small log house was built on Lot 6 Concession 2 where Charles and his brothers stayed while logging off the pine, while a horse barn was built on Lot 6 Concession 1. The Mineral and Timber Electric Railway Co. For a railway between Chelmsford to Wahnapitae Lake. North to James Bay, East to Sturgeon Falls, South to French River and to the village of Killarney. (Signed) E. Sanders. This would be Eliza Sanders, 21 years old. The Chew Brothers Sawmill tried to obtain a lucrative logging contract to cut the white pine around the Wahnapitae Lake area, and was prepared to build a railway between the mill at Chelmsford and Lake Wahnapitae. The Chew Sawmill did not obtain the contract at Lake Wahnapitae, but did secure one in Pembroke Ontario. The mill and all its crew, including Charles Sanders, moved to Pembroke around 1898. 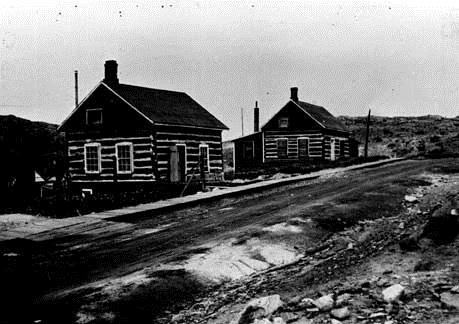 While working at the sawmill in Pembroke, Joseph and Samuel Chew went to visit relatives, Robert and Martha Kennedy who lived in Alice Township, Petawawa, Ontario. They took along their single nephew, Charles Sanders. At that visit, Charles met the oldest daughter of the Kennedy’s, Elizabeth Jane Kennedy a single schoolteacher. 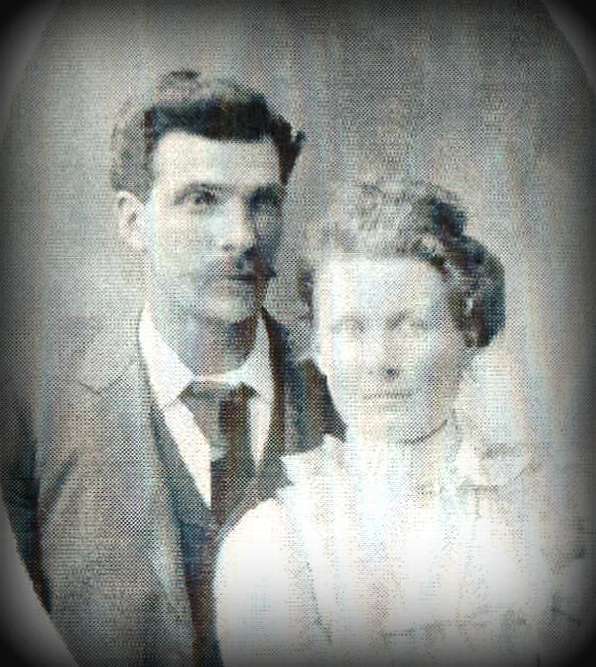 Elizabeth and Charles were married October 17th, 1900 in Pembroke. In 1900, The Chew Brothers, the families and crew, moved from Petawawa to British Columbia. On the train to Copper Cliff were Charles Sanders and his new wife Elizabeth. They were about to build a home that would become the Copper Cliff museum. This hand squared log house was one of the two houses built beside each other in 1901 by Charles Augustus Sanders, age 27 years and his new wife Elizabeth Jane, age 24 years. The log cabins were built from timber cut in the vicinity. Charles was employed as a carpenter building new houses for the Canadian Copper Company. His wife Elizabeth was a school teacher. Besides teaching Elizabeth took in lodgers, one of them was Annie Budreau, 21 years of age and single, according to the1901 Census of Nipissing District, McKim Township. In the second house, lodgers were Edward Slattery, 21 years of age and Edward Husten, 18 years of age, both single. In the house, Elizabeth gave birth to two children. The first of whom was a daughter, Annie Edna Lillian born February 13th, 1902 and then a son, Garfield Garnet born April 3rd, 1904. In the spring of 1905 Charles and Elizabeth relocated to a farm in Balfour Township near Chelmsford. Elizabeth was pregnant with twins, Freeman Willis and Clifford Sterling, who were born on the farm September 14th, 1905. A son Gerald Thomas Robert was born February 14th, 1910, followed by Earl Clayton born December 25th, 1910. Earl died the following day after he fell out of his crib. Daughters Muriel Guendeline was born February 23rd, 1912, and Helen Grace was born June 15th, 1914. Charles Sanders died on July 31th, 1936 in Sudbury. The building was vacant from June 15th, 1969 to December 1971, at which time it was donated to the Town of Copper Cliff by Inco and subsequently moved to its current location on Balsam Street in the summer of 1972. In 1972, a group of six Copper Cliff High School students (Steve Johnson, Karl Wittmer, Brenda Longfellow, Teresa Condari, Sandra Maloney and Lisa Melhorn), intrigued with the idea of a local museum, approached the town and the company with their idea and their wish to use the vacant log cabin to house museum artifacts. Next to the museum is the site of Copper Cliff's first house, the Johnson Boarding House. This site is marked by a stone fireplace (Figure 2). The term ‘Cousin Jacks and Cousin Jennies’ was applied to Cornishmen and their wives who settled in Copper Cliff in the early days. The men were great drillers. They held drilling contests and laid bets that they could drill faster than anyone in the district. They used to ‘drill off’ on the rock near the Johnson Boarding House, where the memorial cairn now stands at Copper Cliff.